Tom Ford says his form is the best it has been for a long time after reaching the last 16 of the UK Championship for the first time in his career. 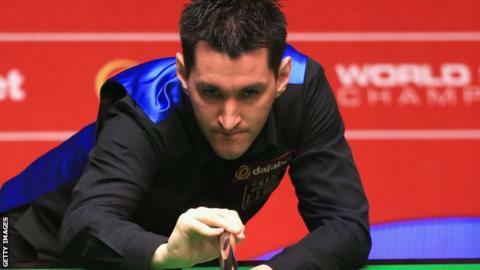 The Leicester man, 32, routed Shanghai Masters champion Kyren Wilson 6-1 and faces Judd Trump's conqueror Liang Wenbo in the fourth round. World number Ford told BBC Sport: "I know I am playing well now. "It is the first time In a long time I have felt good in myself and have felt like my game is good." Ford led 3-0 against Wilson, and although the world number 22 pulled one back with a confidence-building 84, Ford edged the next frame. A fine break of 70 saw him move to the verge of victory, which was achieved in the very next frame. Ford added: "I felt like I played well when I got in the balls and my safety was good for a change, because normally that is not the strongest part of my game. "Kyren missed a few balls to let me in so I was quite happy he didn't really turn up. "The longer the match went on the better I felt. At 3-1 I didn't feel that great, but the balls were going in and that is the main thing. "I felt much better towards the end and if I can feel comfortable, let's see what happens."